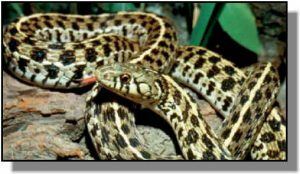 Size: Length in Kansas up to 33 1/4 inches. 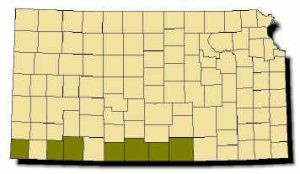 Range: Found in southcentral and southwestern Kansas in the counties that border Oklahoma, from Sumner County in the east to Morton County in the west. Description: Harmless. Rough scales. A serpent with three stripes down the back; those on each side are situated on the second and third scale rows (counting up from belly). The edges of the stripe down middle of back are uneven because they are invaded by dark spots (part of a checkerboard pattern located between the stripes); a large yellow or cream crescent-shaped mark on each side of the head behind the angle of the jaw. Belly cream or yellowish. Young look like miniature adults. Habits: Very secretive. Active from April to October; apparently forages along edge of aquatic areas, but is not restricted to them. Sometimes found on canyon hillsides. Breeding occurs in spring; 6-18 young are born from June to August. Feeds on earthworms, fishes, amphibians and probably small rodents.